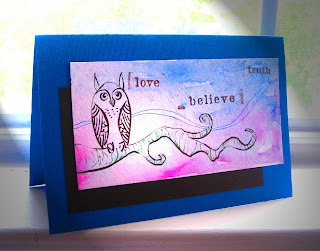 Lisscat Creations: Truth Hoots, yeh you read it right! Truth Hoots, yeh you read it right! I always felt like I was different while I was in school. Not because I had some super powers, or was incredibly smart, but because I loved God. It seems like not many Christians populate in art school, especially in south Florida. Of course God did bless me with some awesome friends during that time. But I'd say my one regret in college was that I didnt get more involved. It was hard to find a group of people that had similar morals to my own. Sometimes ya just want some one to come up to you and make you feel welcome. That's why the group that Lisscat Creations is sponsoring touches pretty close to my heart. InterVarsity Christian Fellowship is an evangelical campus mission working with more than 32,000 students and faculty on approximately 550 college and university campuses. Their goal is to transform lives, renew the campus, and change the world. I think its pretty awesome that this group is trying to encourage students, not only in their walk of faith, but to help change the world for the better. As I always say, sometimes it just takes a smile, or another small nice gesture to turn some ones day around. So, if you are college student, were a college student, love God, like owls, or your favorite color is blue, then you have a good reason to get the newest hand painted Lisscat Creations card now. Then send it to a friend, and feel good that you made them smile, while helping to other organizations (Lisscat Creations and InterVarsity). Blessings, love you all, and thanks for the support!